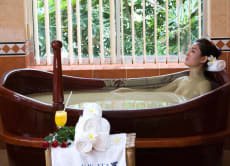 Hello, my name is Lien and I am part of a dedicated team that honorably took the initiative of developing mineral mud and hot mineral water soak baths to create a wonderful gift for all travelers coming to Nha Trang City, Vietnam. Surrounded to a full forest of eucalyptus, fruits, and natural grass, you will surely be impressed by a poetic and picturesque environment in Nha Trang. Coupled with our honesty and hospitality, we hope to bring you extreme relaxation and improved health.